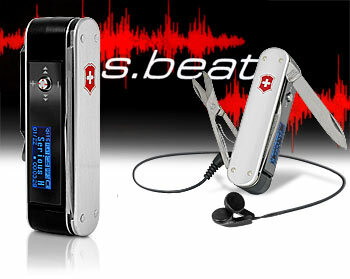 The S.Beat, A Swiss Army MP3 Player | OhGizmo! The Boy Scouts, or any other outdoorsy type, just got a new toy (well, I don’t know about “just got”, this has been around for a couple months): a 1GB, MP3-playing Swiss Army Knife called the S.Beat. Aside from the MP3 playback abilities, it also features an FM tuner and a digital voice recorder with a built-in microphone. On the utility side, there’s a blade, a nail file and scissors. A little armband, some Velcro, and you’re ready to go fight a bear. I like big butts and i cannot lie you otha brothers can’t deny.